Vegan pizza, picked up or delivered till 4am. Daiya vegan cheese. Lots of vegan toppings available, including fake meats. Cheese sticks, too. Usually has big house made vegan cookies. Housed in a typical pizza storefront in a stripmall. I just tried this pizza for the first time and I would definitely order it again. We got a veggie pizza with daiya (just a note, the staff first told us the cheese was a vegan soy cheese but then when we ordered they said it was daiya soy cheese – daiya has no soy – but it was definitely daiya). It was a little on the expensive side, but it had a TON of cheese. I will be back to try some of the faux meat toppings. I love Night Flight Pizza! My favorite is the Herby, but you have to ask if they have the vegan pesto available. If not, I just get the Herby with red sauce or the Woodstock with vegan cheese. I also enjoy getting the cinnamon sticks made vegan. I appreciate the wide range of options they have available, as well as the fact that I can eat here with my (meat eating) dad and we can both be happy. This pizza is the best!!! 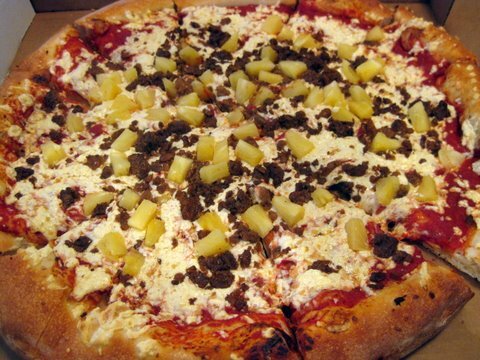 I usually order plain cheese pizza but the Woodstock specialty pizza is wonderful as well! I love how they deliver till 4 in the morning too! Even my boyfriend who isn’t vegan loves their vegan cheese pizza. My boyfriend and I just ate lunch at the Brick Oven Pizzeria on 72nd ST (not Nightflight). I am a vegan, he is not. I had the Herby pizza which had vegan pesto and cheese, artichoke hearts, fresh tomato chunks and also tomato sauce. My boyfriend had hamburger and cheese.The owner, a vegan for 17 years, cooks the pizzas in 600-700 degree oven which results in a nice crispy crust. The pizza was delicious and I loved the flavoring from the pesto. The owner is super friendly and it was fun talking vegan with him. They have much more than pizza available for vegans too, “burgers”, “meatball” subs and calzones. I will definitely return to this restaurant. While we were in Omaha, we ordered a pizza from the Brick Oven. They had plenty of different vegan options. We got a cheese bread, calzone and a pizza. It was all wonderful! They know vegan food there, and are very friendly. We will be going back the next time we travel to Omaha! This place is amazing. My boyfriend and I were in Omaha visiting family and decided to give the pizza place a try. Best decision ever! We ordered a vegan cheese and sausage pizza with pineapple and green peppers and it was the best vegan pizza we have had. My father (meat eating non-vegan) ate four pieces and said it was delicious and he would definitely come back to order a vegan pizza. They also have many other vegan options like calzones, burgers, desserts and more. Highly recommend!